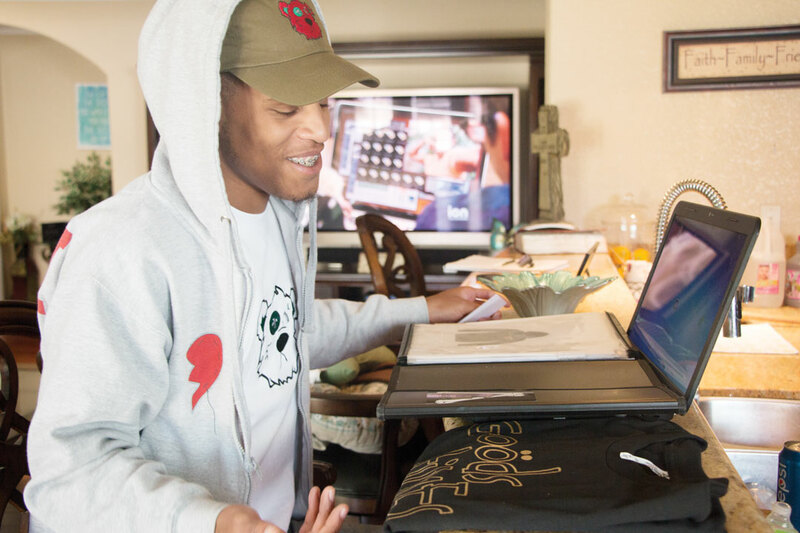 Tramond Wilkerson, the designer and creator of his clothing company, Abandon Goods, went from foster care to starting his own business at the age of 17. The clothing line, Abandon Goods, started as an idea in 2012 when Wilkerson was still attending Valley View High School in Moreno Valley. Wilkerson said the inspiration came from his abandonment as a child, not having a family and feeling unwanted. He said he felt he had talent to offer to the world and turned his reality into his art. At the age of 4, Wilkerson went into the foster care system after both of his parents suffered from drug abuse and domestic violence. For the next four years he would be moved into eight separate homes. During his last year at a group home for boys, Wilkerson said he had to prepare himself for his transition out of foster care. This is when Braden Florence, his best friend and chief financial officer of Abandon Goods, and his family made the decision to take Wilkerson in. Abandon Goods started off as just 12 shirts and has now progressed to an online store with shirts, hats, socks and pants. Through his clothing line Wilkerson wants to be an advocate for kids in foster care and encourage people who want to follow their dreams. Wilkerson said working a job you hate is spiritual suicide and he wants to encourage people to do something they love. Check out Wilkerson’s Abandon Goods website at www.abandongoods.com.